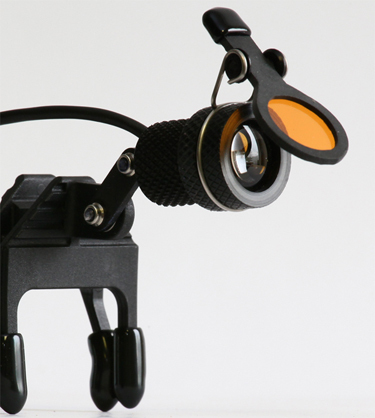 The EOS headlight is available in a variety of clips to accommodate most common loupes and eyewear or can be mounted to a headband. Power is provided by a lightweight, lithium ion battery pack that delivers a full day’s use with a short 3-hour charge time. A unique flip-down filter design allows the user to filter the light so as not to impact light sensitive materials.